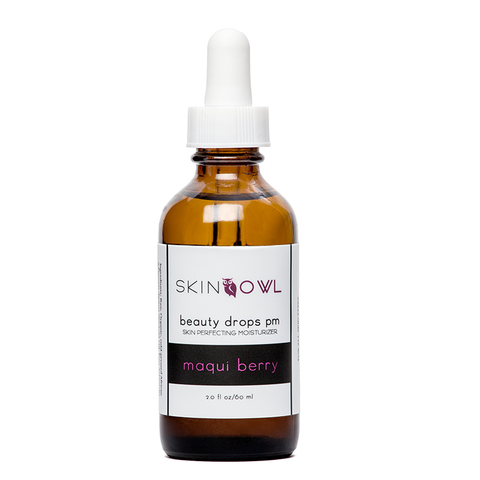 SkinOwl’s Beauty Drops PM Maqui Berry is a triumphant return to a legacy formula that featured an effective yet scarce ingredient, mangosteen. The maqui berry holds 10X the antioxidants and is formulated in the same base of organic baobab seed oil. A native super fruit of Chile, Maqui berries are revered by the Mapuche Indians for their high concentration of delphinidins, a type of polyphenol that helps to reduce signs of inflammation. Using SkinOwl's signature blending technique, maqui berry is mixed with cold-pressed baobab oil, tangerine and vanilla essential oils for a subtle, citrus-forward aroma. Gliding just 8-10 Maqui Berry Beauty Drops on your skin each night makes you look like you've gotten a few extra hours of beauty sleep. Each morning reveals the appearance of clearer, brighter and glowing-with-health skin. Apply to cleansed skin. Place 8-10 Beauty Drops in the palm of your hand and gently warm the oil between both hands. Sweep hands from the neck up the face to the forehead. Then, massage into the skin in upward pressing motions until the oil is absorbed, 1-2 minutes. I'm 50 years old and have very sensitive skin in constant need of moisture. I used the Beauty Drops as my PM moisturizer after cleansing and toning, and my skin always looked great and felt very smooth the next morning. Because the bottle size is generous, it provided four months of use, and I was able to test it in the fall, winter and spring (with breaks in-between); it worked well in each season. I like the minimal ingredient list and citrus-vanilla scent. I let my husband use it for a few weeks, and he liked it, too. I would consider purchasing this again. These work, but dislike the scent. I look for three things in a face oil: 1) efficacy, 2) the texture on the skin, and 3) the scent. As to the first, if you are acne-prone, this is definitely a face oil you should consider. I did not find that the anti-inflammatory properties helped with my mild rosacea, however, which is more of a pressing concern for me. The finish on the skin was okay, but not as good as my favorites (Max and Me Enchanted, Honua Olena). The killer was the scent. I do not like sweet scents in face products. The creamsicle note isn't overly strong, but it isn't pleasing either. I passed this on to a friend with acne issues. I wasn’t expecting to love this oil so much. There’s a lot of product, a little goes a long way, and it smells heavenly! I have tried so many things for my really dry skin and while I still have some flakiness throughout the day this has come closer than a lot of other green beauty products at keeping my skin as flake free as possible. I say that, but I also need to clarify that green beauty products in general have done a way better job for my skin than any other products I use to apply. I received this yesterday and used it only one night and my skin that has been ANGRY for weeks woke up calmed and soothed. I love that it only has a few ingredients, and they seems to be a magical solution for my sensitive acne prone skin. Hydrating enough without being pore-clogging . And the scent is heaven!!!! I asm so happy to have found this product! These drops are the balm! This is the most magnificent bottle of facial oil ever! The smell is just divine. Citrus, vanilla, and a touch of something else. The scent is reminiscent of a creamsicle, only even more luscious and decadent. Not only does the oil smell amazing, it feels even better. Somehow the drops are extremely moisturizing without being greasy or too heavy. The first time I tried these drops I woke up with the most gorgeous, supple, dare I say glowing skin in the morning and my chapped, sunburned skin was gone. This product is definitely a winner.